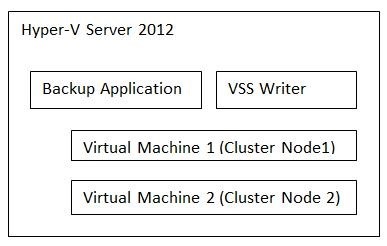 Microsoft Cluster Requirements: Servers, NIC and Storage must validate Microsoft cluster requirements to configure MSCS using two or more independent computers . 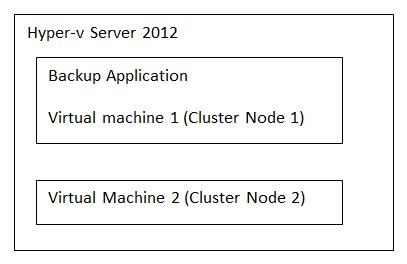 The objectives to create a cluster is to avoid a single point of failure that is to create a high availability for services or application. 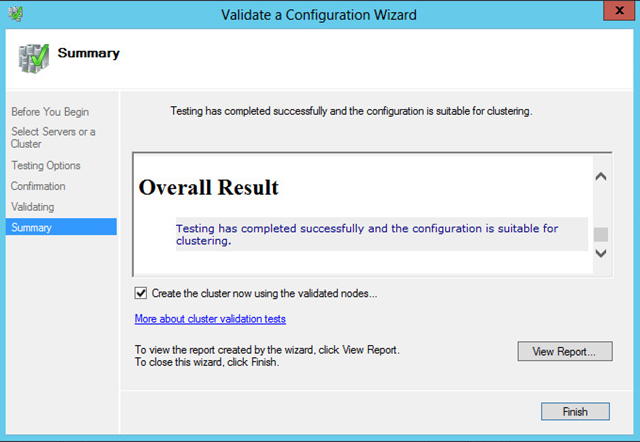 Before you configure a cluster you must keep in mind that your design must meet this primary conditions. To achieve redundancy, you can connect your cluster nodes with networks that is constructed with teamed network adapters, redundant switches, redundant routers that removes single points of failure. Serial Attached SCSI or Fibre Channel must be identical and use same firmware version. 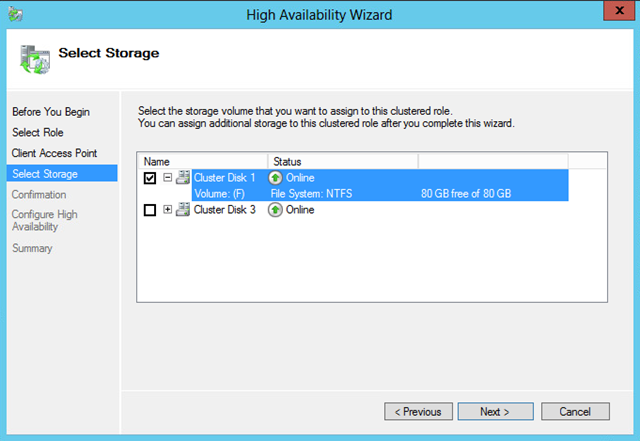 For iSCSI storage, you must use dedicated HBA or gigabit network adapters for storage purpose. This adapter can not be used for network communication. 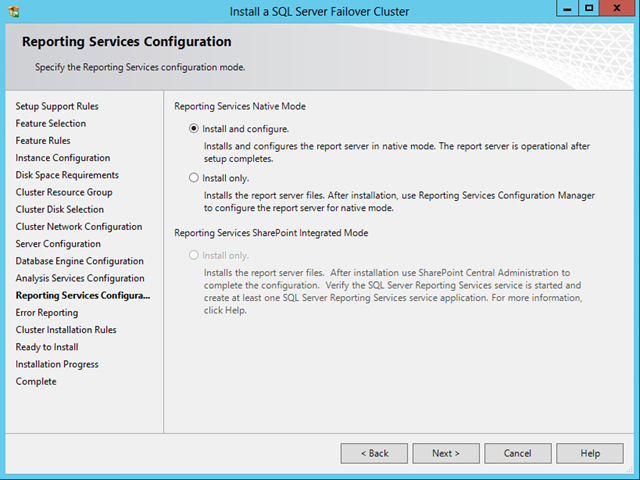 To use the native disk support included in failover clustering, use basic disks, not dynamic disks. 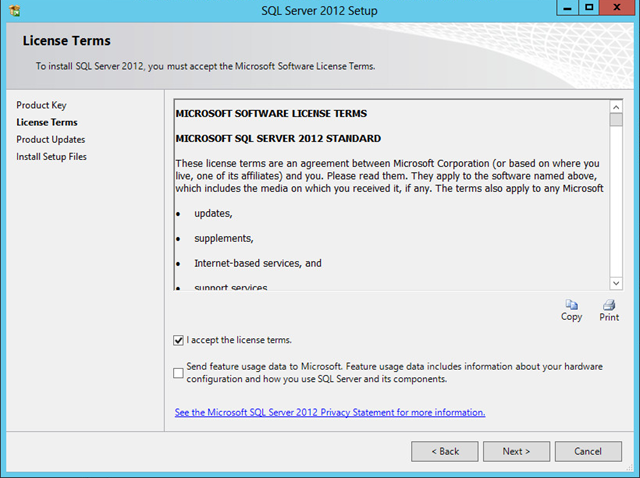 Microsoft recommend that you use NTFS for quorum disk and shared storage. you can use either master boot record (MBR) or GUID partition table (GPT). 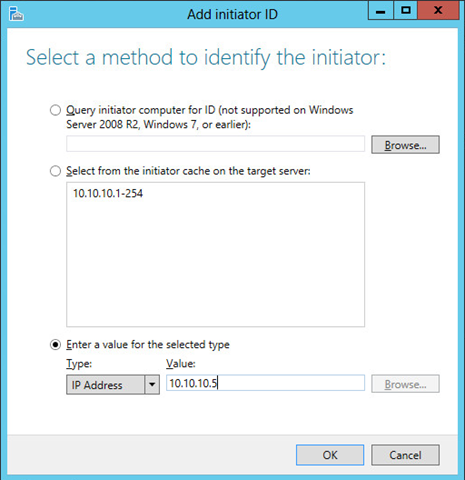 A LUN used for one set of cluster servers should be isolated from all other servers through LUN masking or zoning. 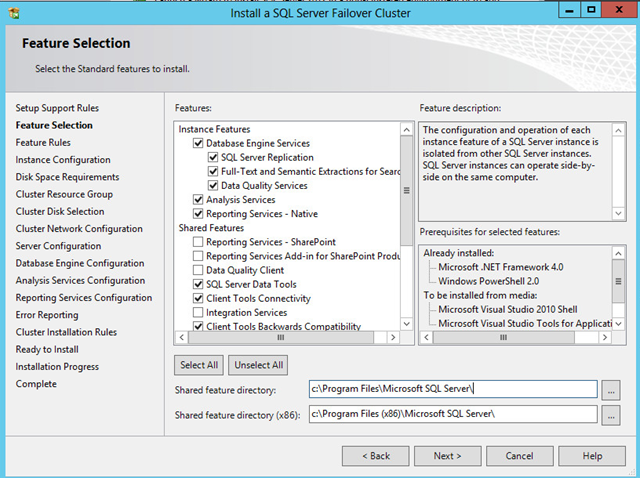 In a highly available storage fabric, you can deploy failover clusters with multiple host bus adapters by using multipath I/O software or Microsoft Multipath I/O (MPIO). At least two HBA of server connecting two different fabric switches. 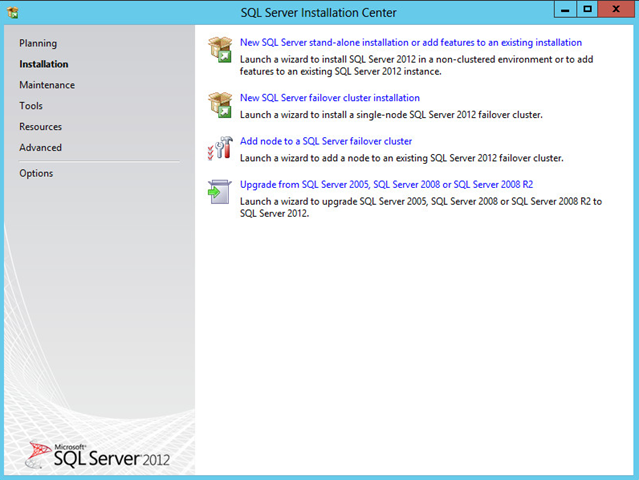 You can configure Microsoft Cluster using all version of Windows Server 2008 Enterprise and data center. 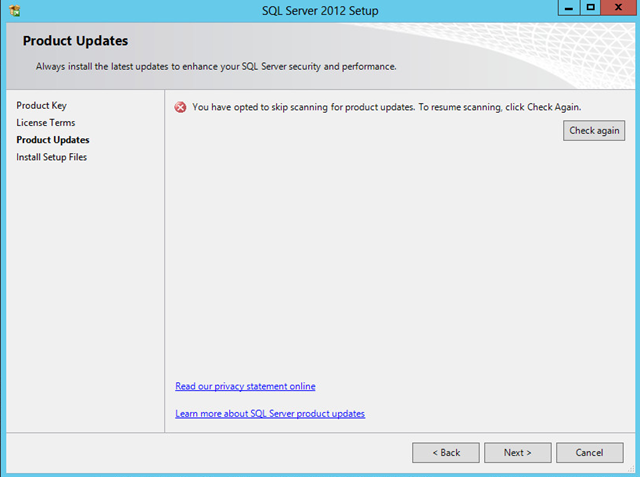 You must configure both node using same architecture, OS, patches and hotfixes. 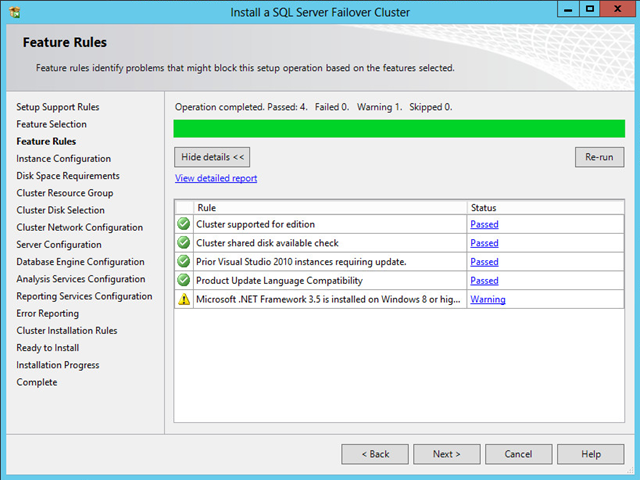 For example, if one node is x64 than all other node must be x64 in a single cluster. 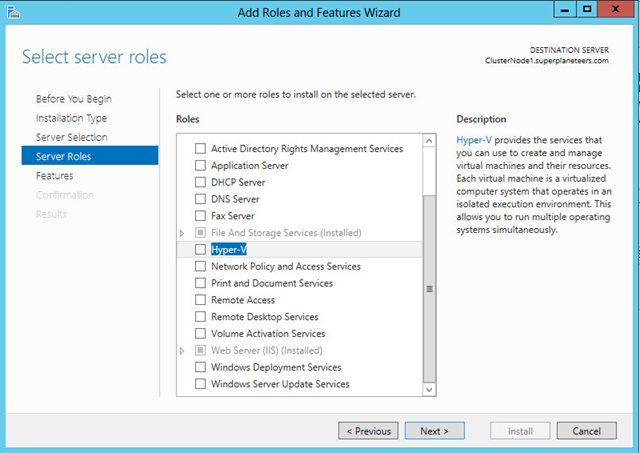 To achieve MSCS, you must have functional AD DS, Active Directory Domain Controller, Administrative roles to manage MSCS. 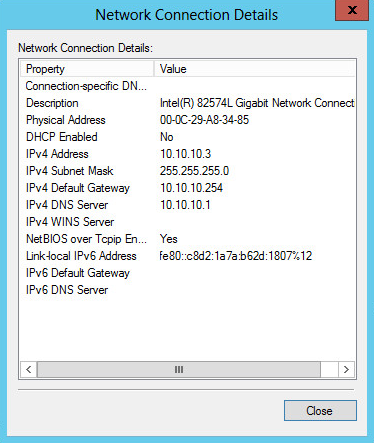 IP addresses assigned from a Dynamic Host Configuration Protocol (DHCP) server for the cluster administration address (which is associated with the cluster name) or any IP address resources. 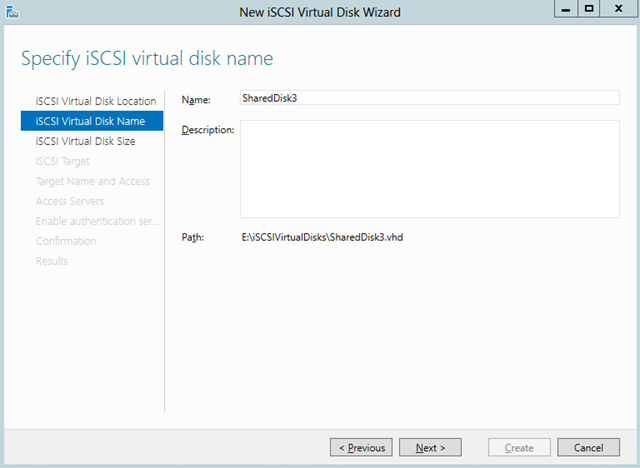 MSCS can not be formed in between two nodes that are members of two different Active Directory forest. 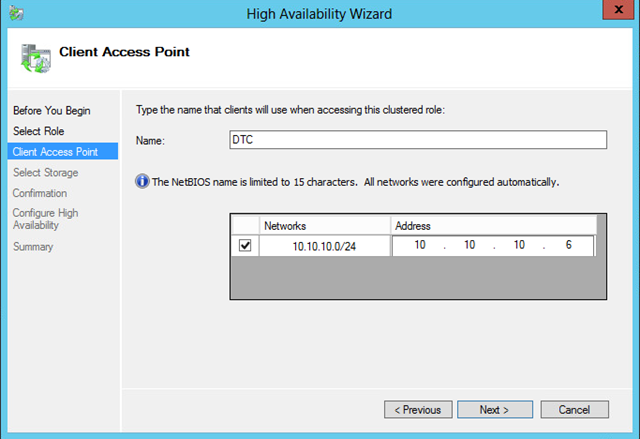 Configure Network: MSCS requires minimum two network adapters in each node of the cluster to be certified for the HCL. One for heartbeat network and another for public network or simply data transmission for internal network. All network cards on the public network need to be on the same logical network (same subnet) regardless of their physical location. It is recommended that you put the private network adapter from Class A, Class B or Class C IP rages. 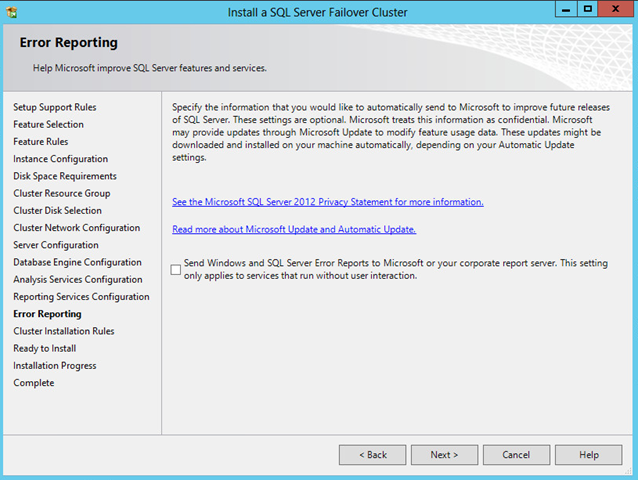 Microsoft does not recommend that you use network teaming on a cluster. 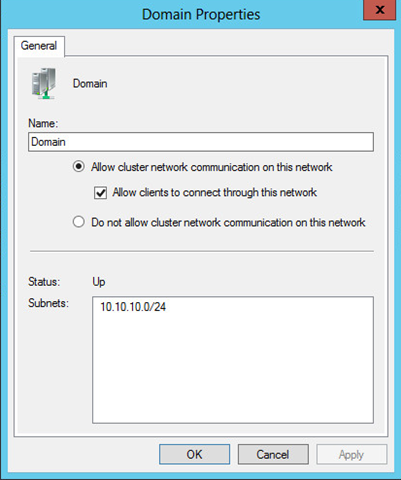 However, if you do use manufacturer-specific network adapter teaming software (dell advanced network management suite) it must be seamless to the cluster and must reside only on the public network. NIC is connected with a separate crossover cable (or to a switch in same vlan). 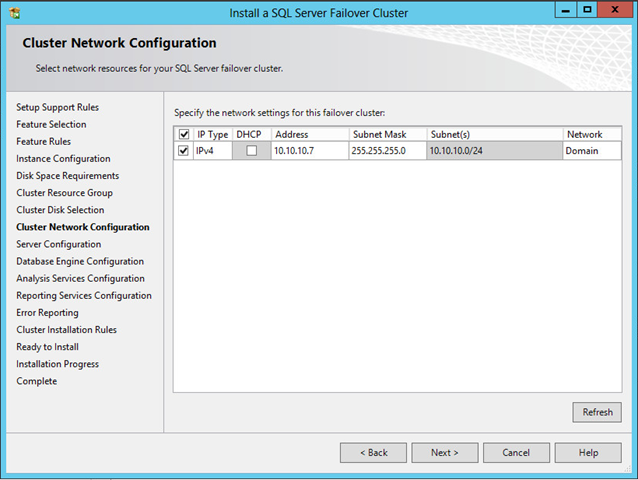 Open Failover Cluster Management Console>Click on Networks>Right Click on Heartbeat Network>Click Property>Click on “Do not allow the cluster to use this network”>Click on Apply and OK. 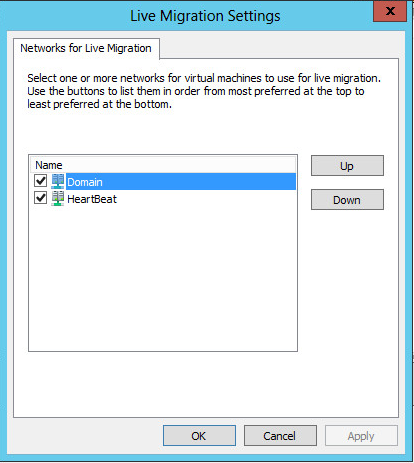 Note that this NIC is dedicated for heartbeat network. Client should be using another network. 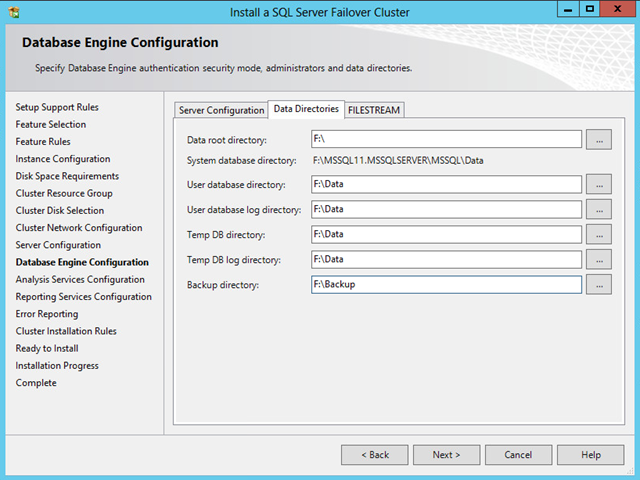 Add target disks for quorum and shared storage. 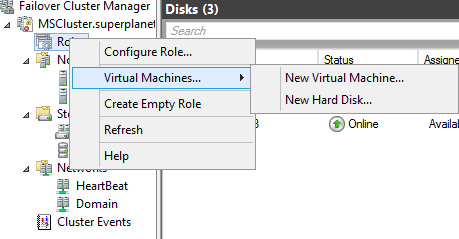 Start Freenas VM. From Console setup, setup LAN IP and WebGui Password. 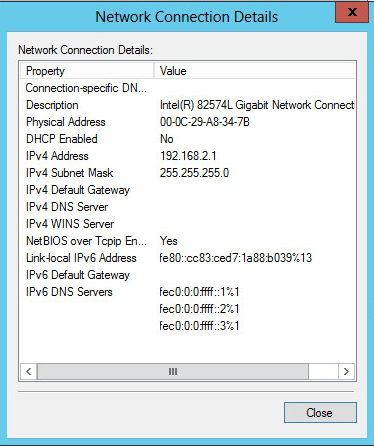 Open IE in Windows 7 and browse freenas ip. Make sure script and active x allowed in IE. 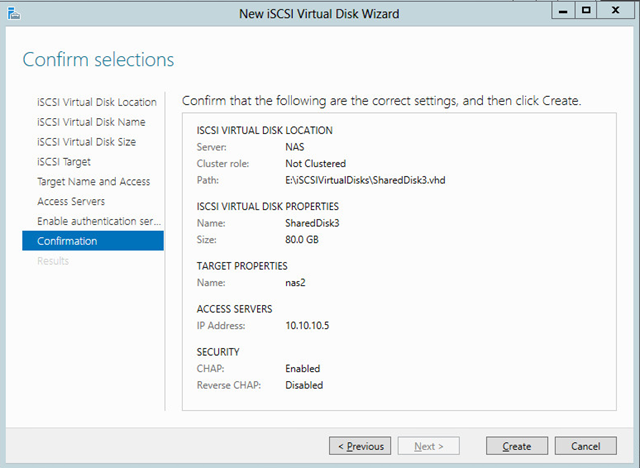 Click Services>iSCSI target>Click on portal>Add IP address as your LAN IP address you setup in LAN IP. 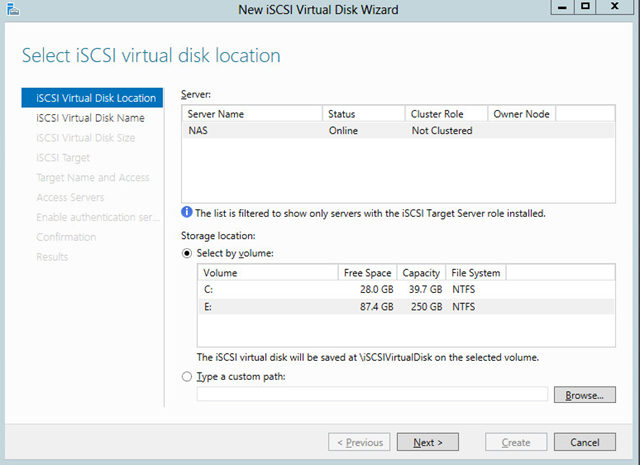 Click Settings>Enable iSCSI target. Do not change default settings. 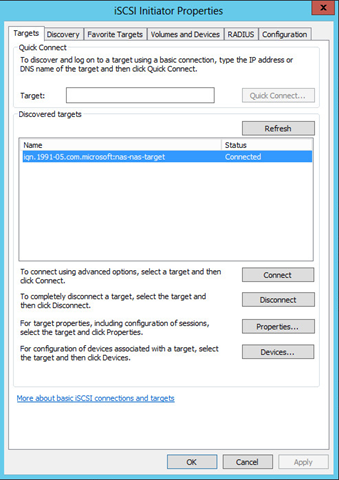 Click Target>Click Add Extend to mount disk. 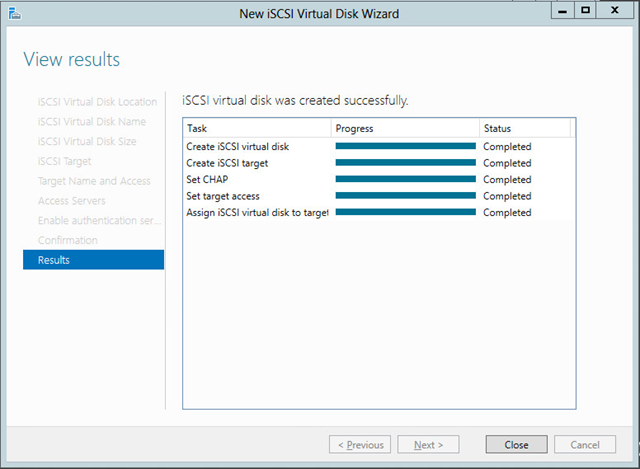 Once finish, add target and assign to this disk you added in previous steps. add many disk and target you want from this window. Apply changes. 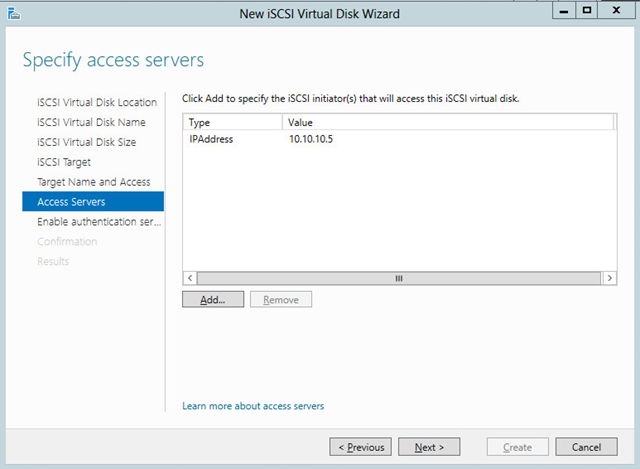 Log on to Cluster server, Administrative Tools>Click iSCSI initiator>Click on Discovery Tab>Click on Add portal. 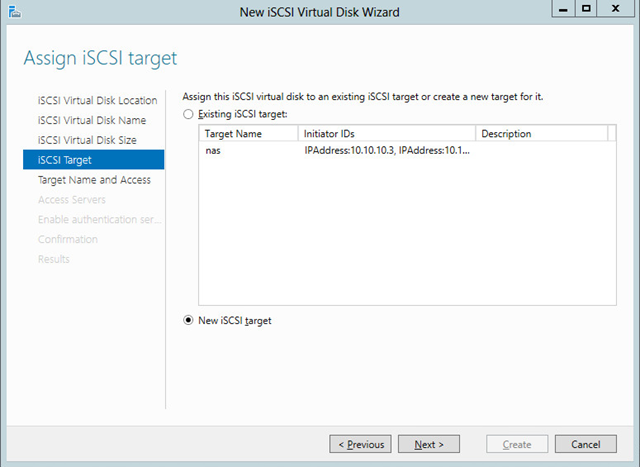 Type the ip address of the iSCSI target, leave rest of settings default and add target portal. Click Targets tab>Click on refresh. you will be presented with target disk. 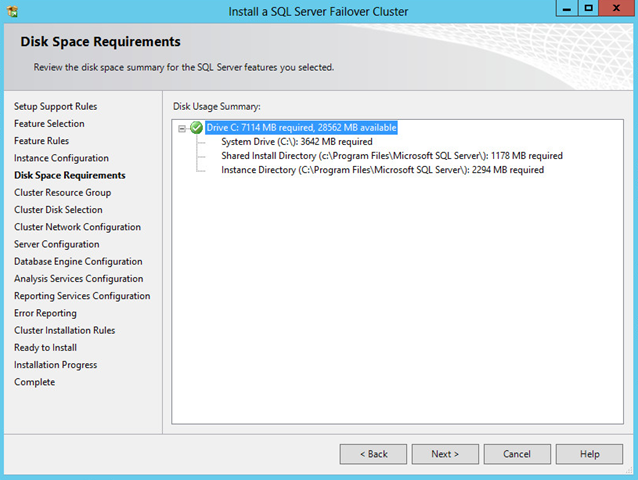 Select target disk, click log on. 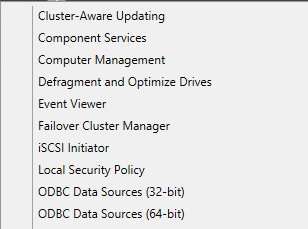 Check Automatically restore this connection when computer start, click ok.
Start Menu>run>type diskmgmt.msc and click ok>See the disk visible to Cluster server. 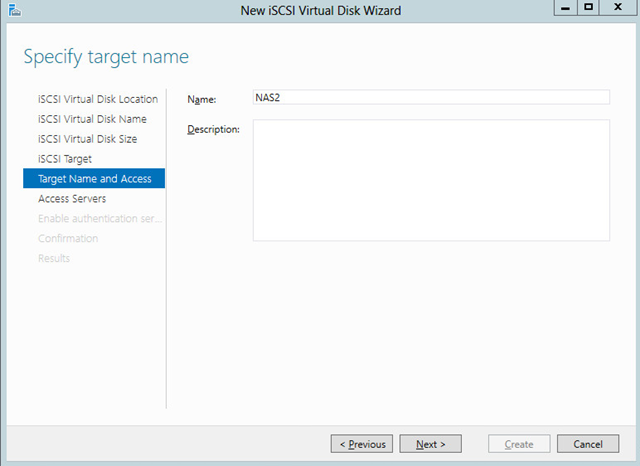 Configure the disk as basic and NTFS file systems. 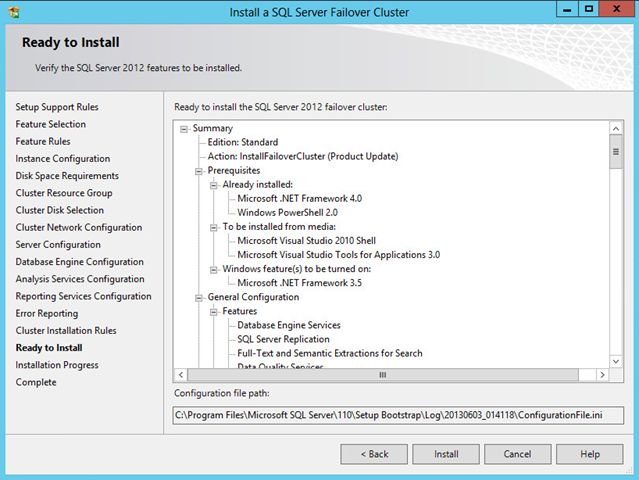 Note that for this article, I am using software initiator as I don’t have a HBA in my test infrastructure. 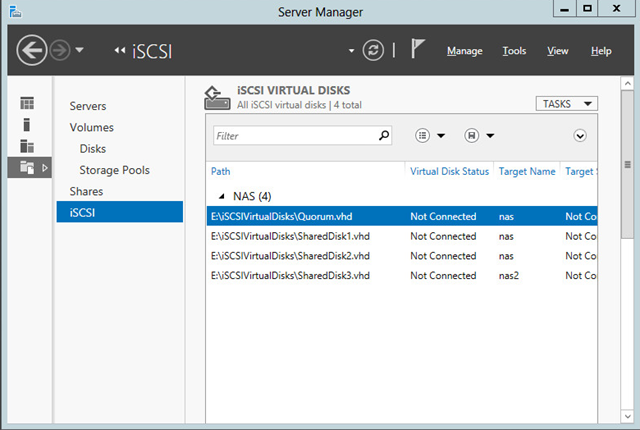 So don’t ask why use MS iSCSI initiators. you can use other means of connecting storage with your server. 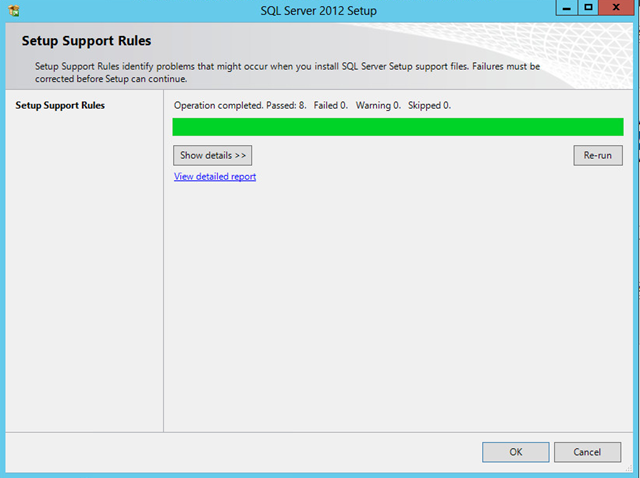 you are free to do so as long as it support Microsoft HAL. 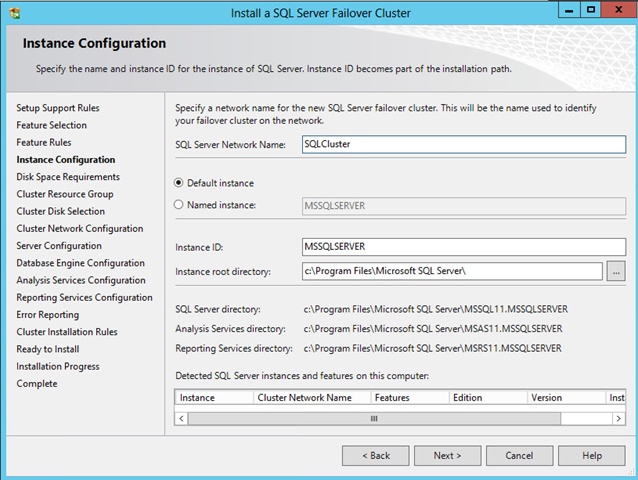 Install Fail Over Cluster Feature: In the Server Manager, Click Add Features Wizard, click Failover Clustering, and then click Install. 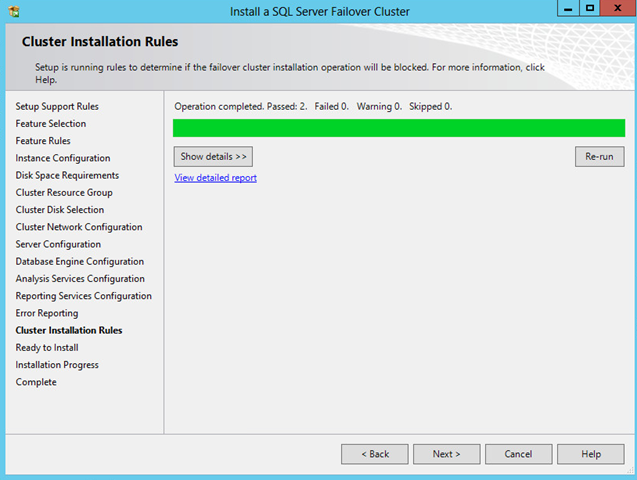 Follow Installation Wizard. 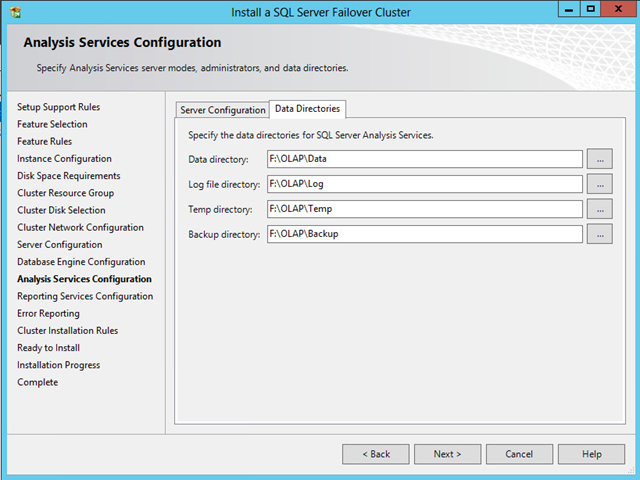 Configure Cluster: To open the failover cluster snap-in, click Start, click Administrative Tools, and then click Failover Cluster Management. 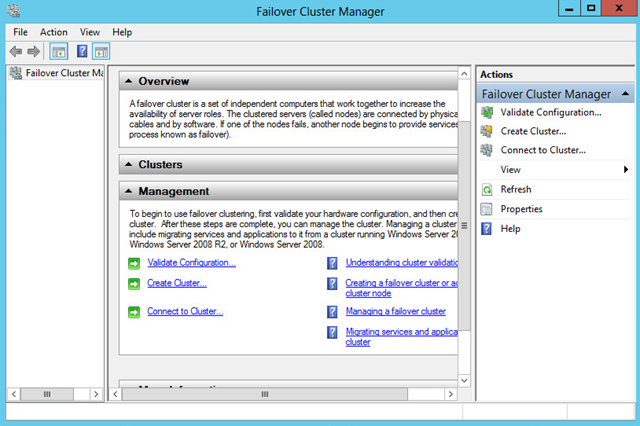 Right Click Failover Cluster Management> click Create a cluster. 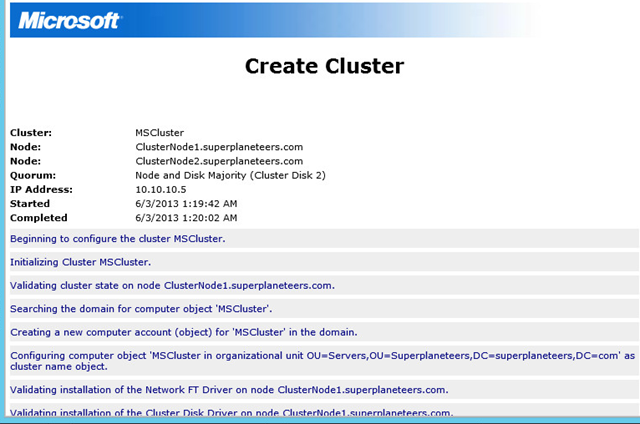 Add servers that involve in this Cluster, Type IP address, Type name of the cluster, Add shared storage. 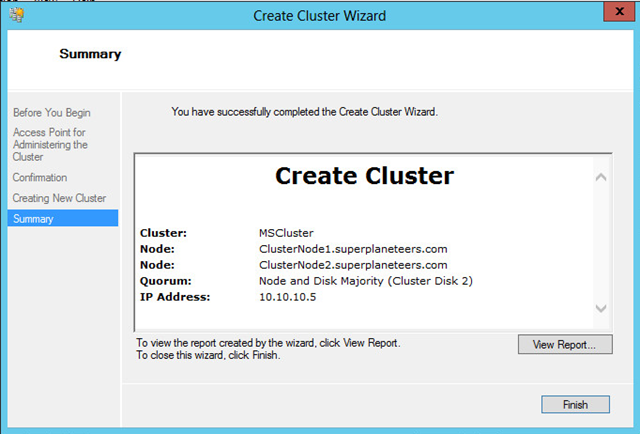 Follow wizard and finish creation of cluster. 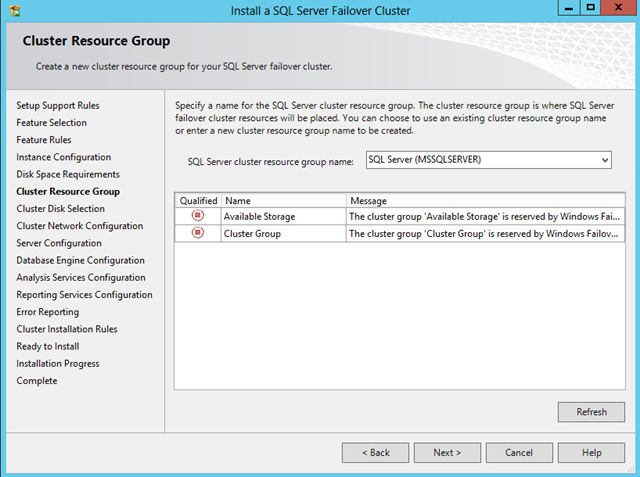 Open fail over Cluster management, Click Storage and view available storage. 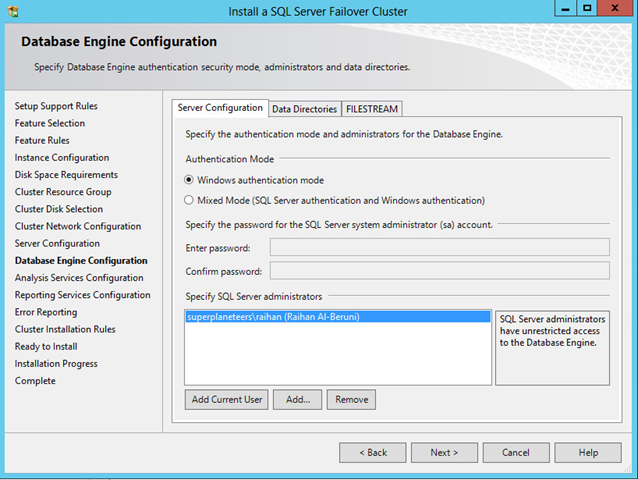 You may level your quorum disk as “quorum” and “Q” as drive letter to quickly identify quorum disk. The quorum algorithm is a mathematical method for determining if a majority of Cluster members exist so resources can be shared across an Cluster system. Quorum is the number of votes that must be present for the cluster to function. 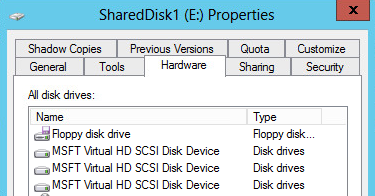 A cluster system can designate a disk as quorum disk. 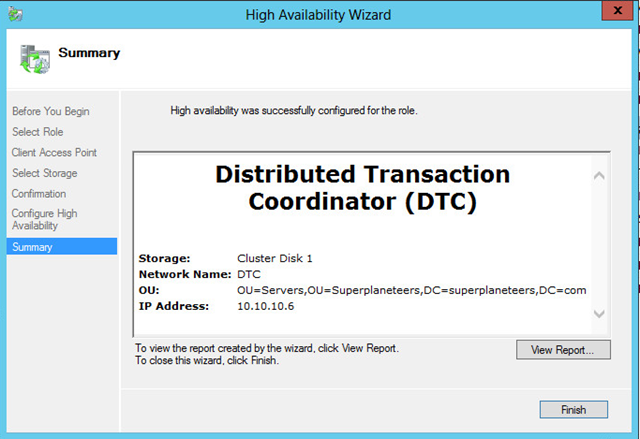 The quorum disk acts as a virtual cluster member whose purpose is to add one vote to the total cluster votes. 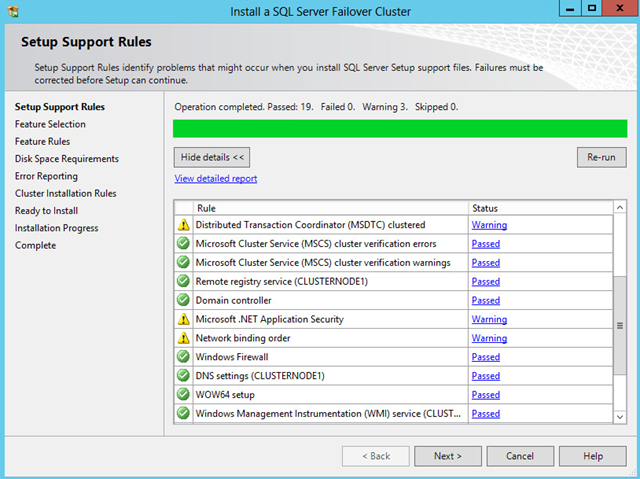 For example, if you have a thirteen nodes cluster and your seventh node fails then cluster will be inoperative. 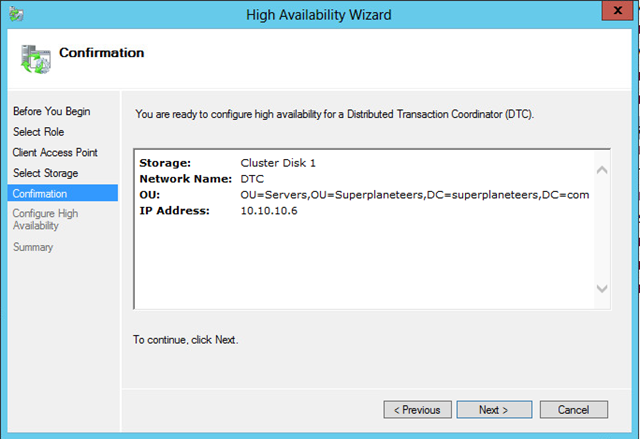 By establishing a quorum disk, you can increase the availability of a two-node cluster; such configurations can maintain quorum in the event of failure of either the quorum disk or one node, and continue operating. There are four quorum modes, they are Node Majority, Node and Disk Majority, Node and File Share Majority, No Majority: Disk Only. 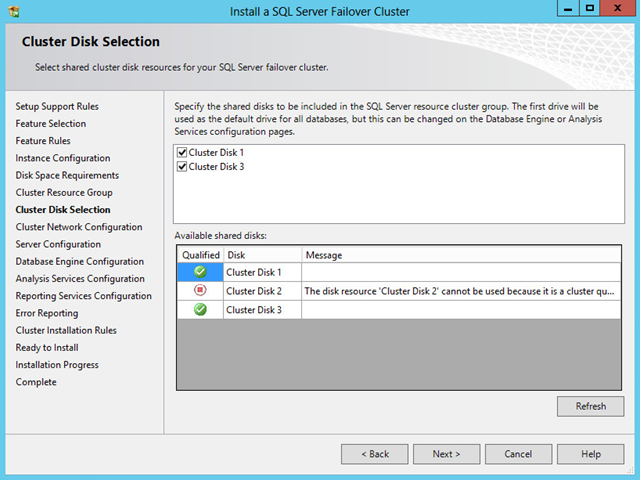 Right click on Storage>Click add disk>Select Cluster disk>Click ok. You can create 2GB quorum disk for your cluster. Don’t worry about this screen shot. This is just for this article. 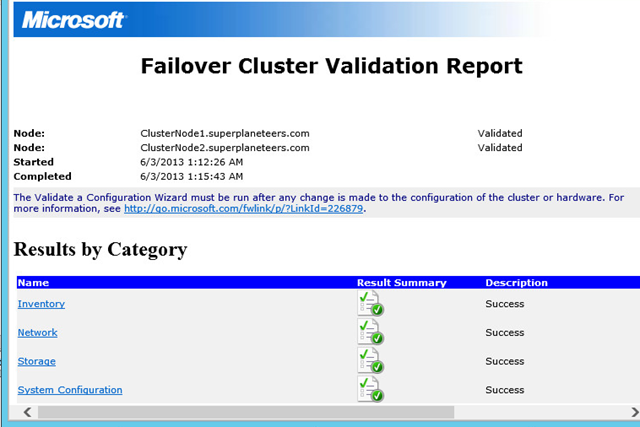 Right click on Fail over cluster management>Click on validate cluster>Select on disk validation and perform validation. You will see you passed validation. 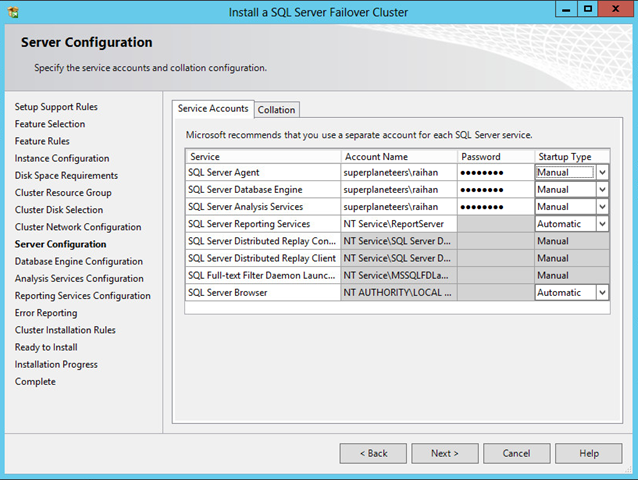 Right-click on FQDN of Failover Cluster, click More Actions, and then click Configure Cluster Quorum Settings. 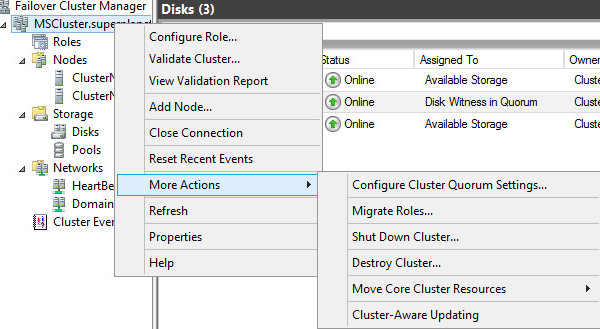 MSCS will recommend cluster mode for your settings, select recommended. Click Next. 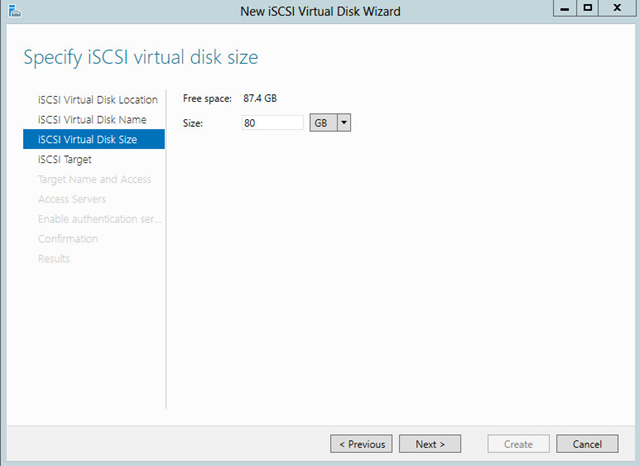 Select Witness storage disk and click next. Click finish and see the report. 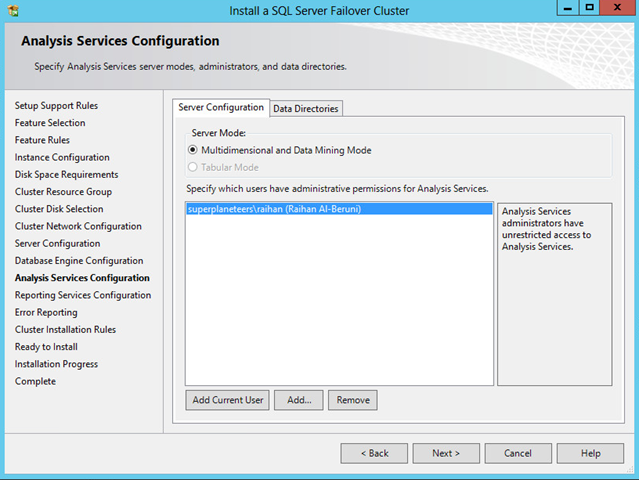 Configure Services or Application: Once you finish, configuring MSCS, now you are ready to create service or application in this cluster. 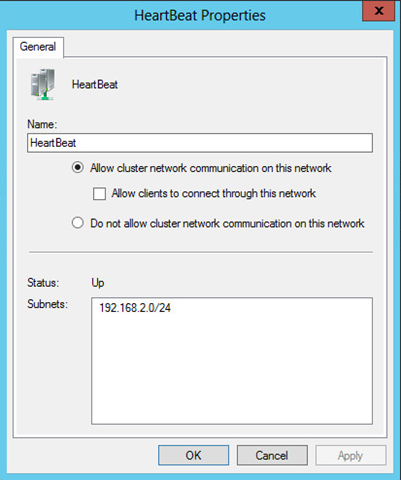 For this article, I am going to create DHCP Cluster. 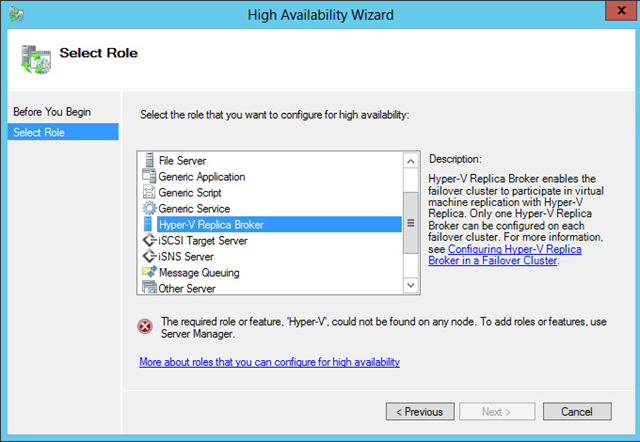 Please note that, to create a clustered services or server role you must have specific server role installed in both node of cluster. 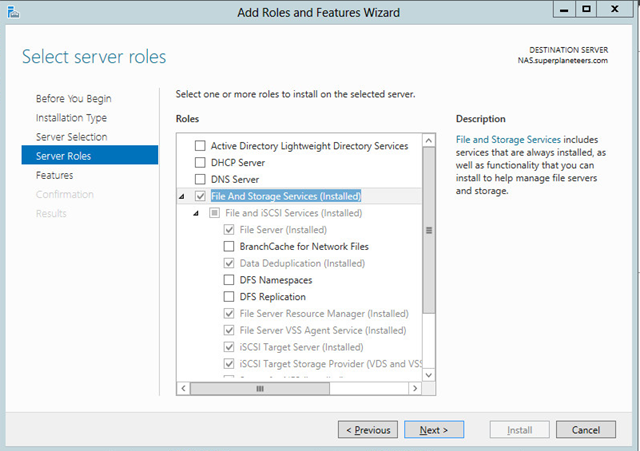 Right click on services and application>Click Configure a service or application> Select DHCP Server>Click Next>Type Clustered DHCP IP address>Select Shared Storage, Follow wizard and Finish. 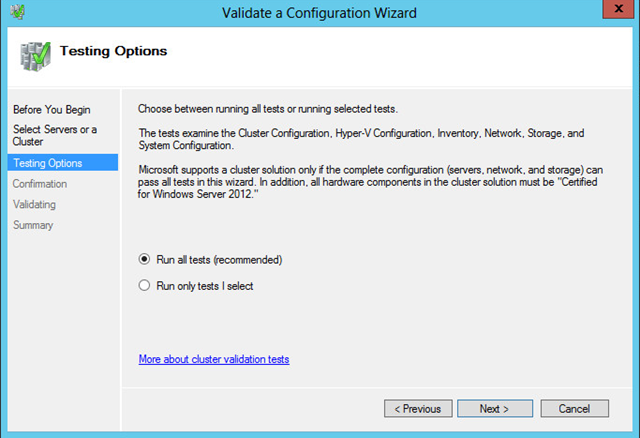 Now right on testDHCP>Click Manage. 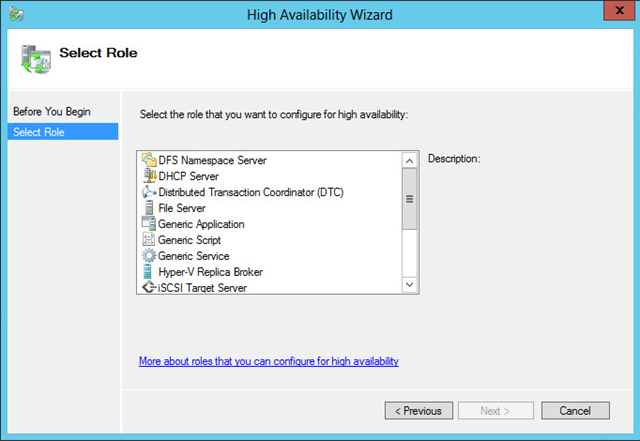 Now you add DHCP scope, superscope. 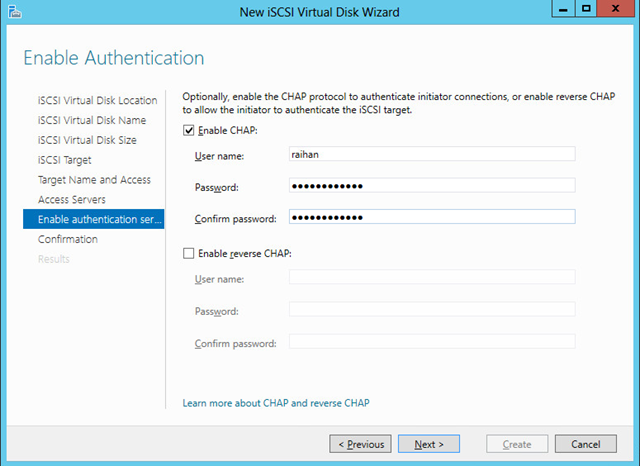 Note that your ip helper address in Cisco L3 switch or core switch will be the virtual cluster IP of DHCP cluster. Command Line: Open Elevated Command prompt. 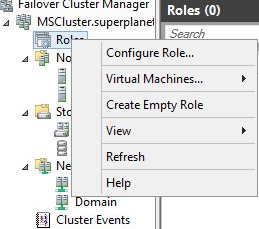 Type Cluster /help to see all cluster commands. 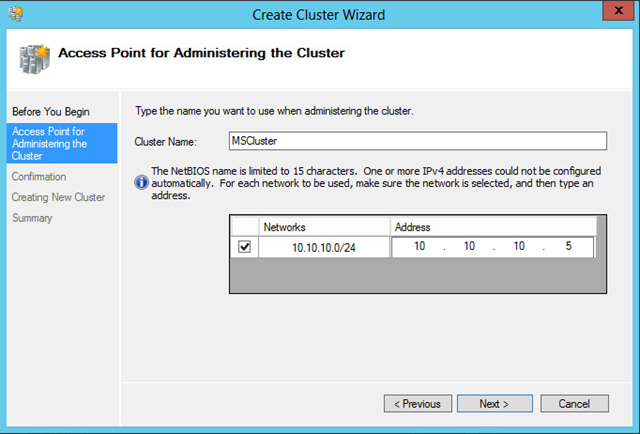 Type Net Start CLUSSVC /FQ and press enter to start cluster quorum. 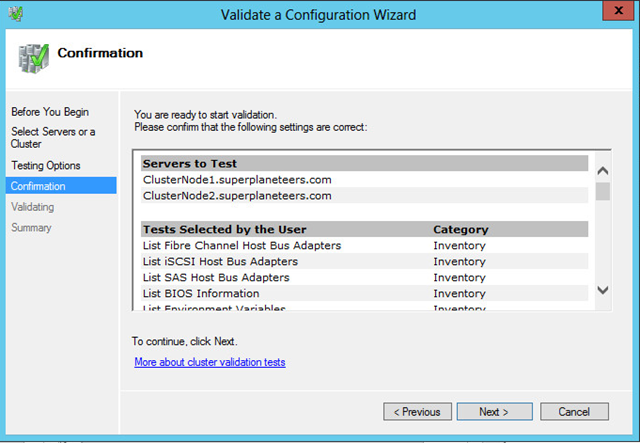 Type CLUSTER [cluster-name] NODE node-name /STATUS and press enter to see the status of cluster node. 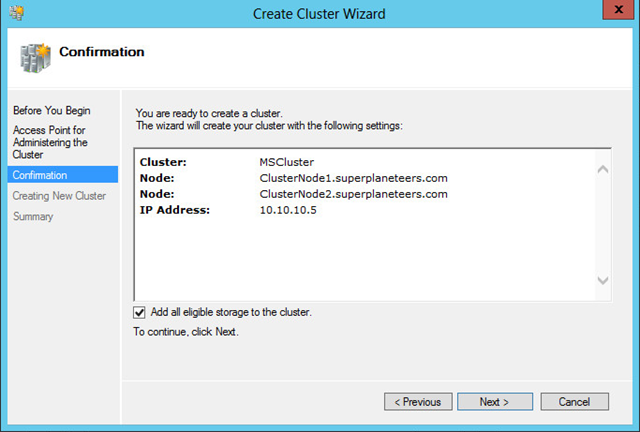 To seek more help about cluster node type following and press enter CLUSTER GROUP /? 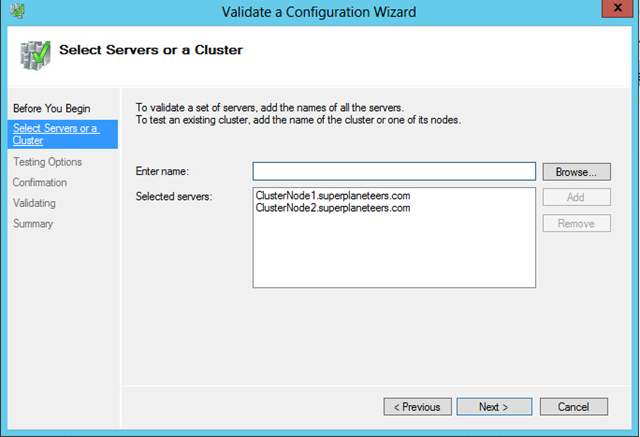 and CLUSTER NODE /?